Come on down guys and see some great National League Ice Hockey. Adults are $15 adult and child passes $10 wee ones are in free. The lads love to see you all there supporting them. Get your tickets from any Canterbury rep team players also or from the above phone number Its a great way to support our teams so rock on down... get your ticket earlie and your support will be felt two times over! 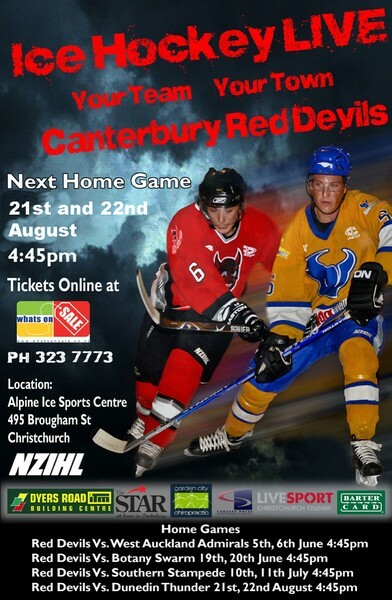 See you there on the 21st & 22nd August for the Canterbury Red Devils VS the Dunedin Thunder.